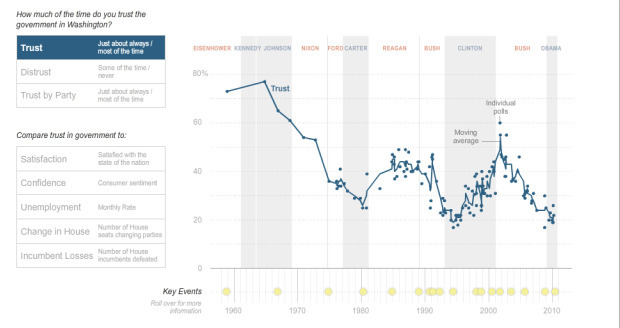 While trust in the people who make the laws may be bumping along the bottom, a new survey from the Pew Internet & American Life Project finds that government Web sites could be the thing that increases American faith in its leaders. Only last week the Research Center released data–which you can see above–showing that the crappy economy, combined with the hugely partisan political view and an unhappy populace, is leading to epic discontent with U.S. politicians. 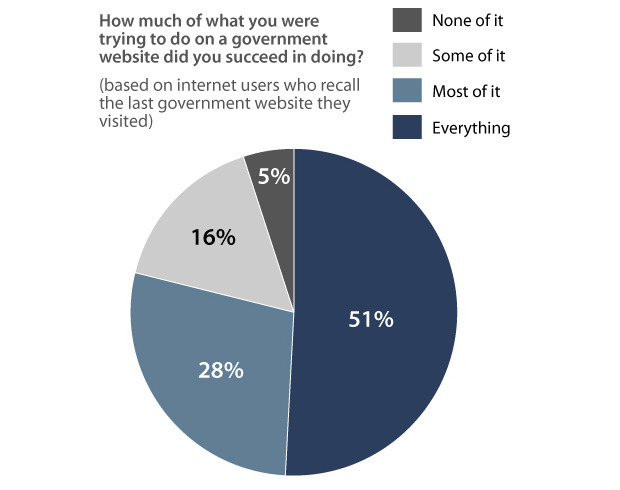 But Pew’s Government Online report discovered that people who use government Web sites to either make a transaction (pay a parking fine, obtain a hunting permit, etc.) or discover more information about an issue, had more positive attitudes toward the Washington elite–and this was even more pronounced in the case of local government. Heavy government Web users also used other methods to get in touch with their politicians, including letters, phone, and face-to-face contact, although they were not always satisfied with the results. 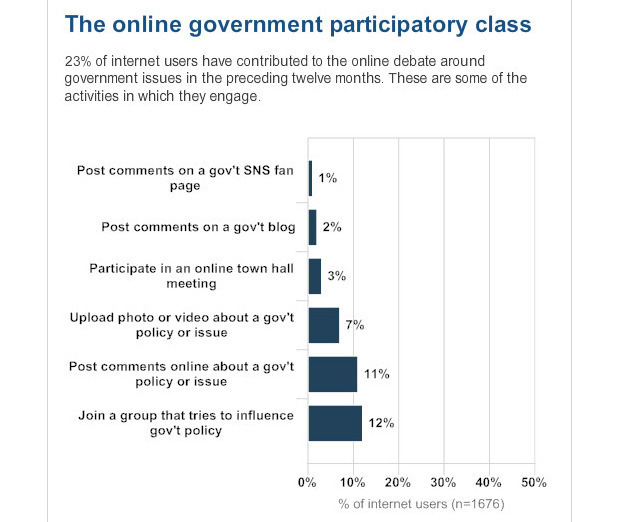 Of the people surveyed without Internet access, almost two-thirds of them thought that the government was either less open and accountable, or about the same as in 2007. The study also touched on the use of social media and government issues. While 9% of heavy media users admitted to following or friending a government agency on a site such as Twitter or Facebook, social networks came way behind direct access, such as reading an agency blog, watching a video on a government site, or even receiving SMS updates. But the business of day-to-day government isn’t a presidential election, so it’s not exactly surprising. It could be argued that Obama’s “open-source” government has almost more at stake for the politicians than the public. And any politician daring to raise the issue of the vast sums of money needed to bring one of the more costly parts of the administration’s technology plan should see that a well-connected population is a more active one as well.